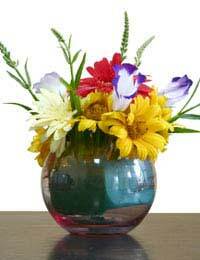 Ikebana is a traditional Japanese art of flower arrangement that has been practiced for over 600 years. However, Ikebana is much more than just decorative. Every arrangement produced in this way is done so with regard for the colour combinations used, the natural shapes and lines of the "living" elements and the meaning of the entire composition. Many amateur and professional florists remain unaware of the complexities of Ikebana flower arranging, so below are some basic answers to frequently asked questions about this art form. Ikebana is a traditional Japanese art form that uses living elements such as flowers, branches, leaves and grass as the materials to create a harmonious and often spiritual or philosophical arrangement. Ikebana began in Japan over 600 years ago and it is thought that it was originally a means of offering flowers to the spirits of the dead as in the Buddhist tradition. It was not until the 15th century that this art diverged from its religious origins. Throughout history many different schools of Ikebana evolved, including the Ikenobo, Koryu, Enshu, Ohara and Moribana. The three most predominant modern schools include Ikenobo, Ohara and Sogetsu. How is Ikebana Different from Other Forms of Flower Arrangement? Ikebana is more than just a way or organising flowers to create an aesthetically pleasing arrangement. This art form usually has an underlying spiritual or philosophical basis to each arrangement, and indeed each aspect of the arrangement is usually invested with meaning. Usually Ikebana arrangements are asymmetrical and very often the empty space within them is just as important as the other materials. Indeed, even the container used for the arrangement and the setting of the arrangement are important in Ikebana. Is Ikebana a Popular Hobby? Around the world both men and women practice Ikebana, but it is more than a hobby for many. Ikebana is a profession for many, including those who teach the art to others. What Kind of Materials are Needed for Ikebana? The materials used in Ikebana arrangements often differ according to the purpose of the arrangement. For example, peach, pine, weeping willow and winterberry area all materials used in Ikebana arrangements for celebratory or auspicious occasions. The occasions often take the form of national holidays or special festivals. Most Ikebana arrangements contain some combination of flowers, branches, leaves and/or grass as well as a bamboo, glass or ceramic container. Where Can I Learn More About Ikebana? A variety of books and websites exist which discuss and offer step-by-step instructions on Ikebana. Florists trained in Ikebana may offer lessons in your local area, or Japanese cultural or community centres may offer classes. Night classes may also be given in this art and many workshops and even holidays devoted to Ikebana are available. The Ikebana International London branch will also be able to offer more information on Ikebana. The London School of Ikebana and the Royal Horticulture Society (www.rhs.org.uk) will also be able to provide further information on this topic.